Last updated 26th March 2019. Experts claim that the best about me pages have killer conversion rates compared to other pages on your blog. Why then do most bloggers find creating a great about me page one of the most daunting blogging tasks ever? Let’s dial back a bit now so we can understand why it’s so hard to create the perfect about me page. 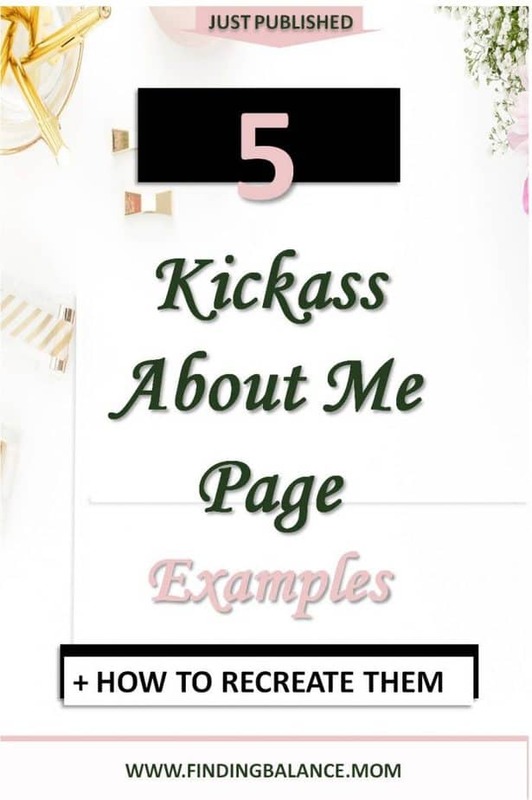 Use this free About Me page template + 5 point Checklist to quickly build a great about page. You’ll also get access to my FREEBIE LIBRARY! And convert the people who come to read your posts so you can eventually sell to them (or heck start selling to them immediately!). Geez thanks, I’ve only wasted 6 months blogging. But make money blogging you must. So you revamp your whole blog, maybe even invest in a pretty theme to increase your conversions and you see it working! Except, your new blog could very well be just anyone’s, there’s no you. Enter the about me page. Your one chance to talk freely about yourself, your gorgeous beau, your cute little kiddos, and your bald one-eyed kitty Fred. They want to know you right? Wrong again, they don’t really want to know about you, yet. You probably know this and that’s why you find it so hard! They want to know why you are the best person to listen to about their problem. Every single clickthrough to your about page is your reader actually saying “Hey you write great stuff, now convince me to take every word you say as law”. And if done right, your about me page will have conversion rates your other pages can only dream of. Plus those subscribers will be your most engaged subscribers. They were already looking to be won over, challenged you and you killed it! So how do you create an about page that compels your new challenger to bow down? Let’s start with some great about me page examples. Lenore starts her about me page with a controversial story that makes you choose a side immediately and leave if you aren’t her target audience (thats a good thing) or be dumbfounded and fall in love with her if you are. Her very first two sentences provoke you to either say “Serves you right” or “Oh, that’s awful”, either way she’s got your attention. But that’s not all, she proves she’s worth your attention from the very first sentence; not just anyone gets to write a column for The New York Sun. The rest of the page takes you on an emotional roller coaster that has you setting your kids free in the yard immediately! She’s used her about me page to consolidate her influence and now you can’t forget her name. Side Note: Interested in creating a strong brand, your graphics matter more than you think. 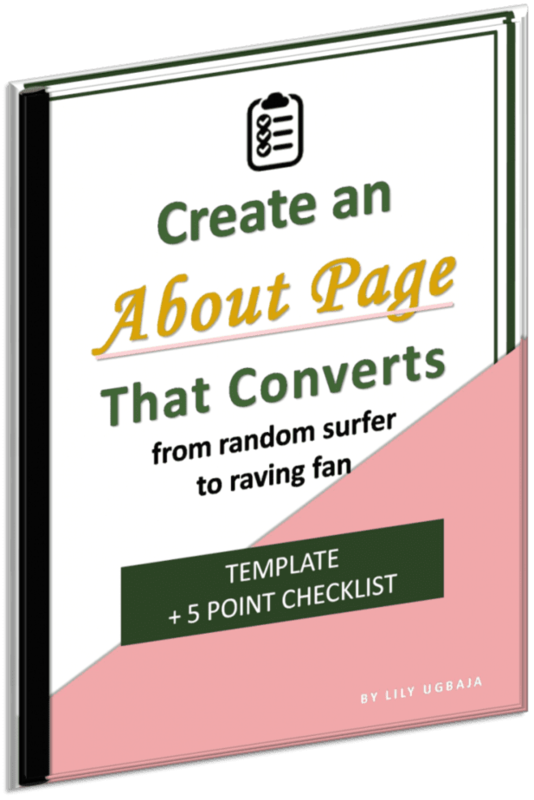 Learn how to design your blog growth or get these fully customizable templates for everything if you’d rather not DIY. As you can see from the image, Katie uses her above the fold space to say exactly what you should expect from her and her website. Dashing Dish recipes are different than other ‘healthy recipes’. Every recipe is made with healthy, wholesome ingredients without losing any of the flavor! … they are made with 100% whole ingredients and do not contain any flour, sugar, or processed ingredients. … Every recipe also lists the calories, carbohydrate, sugar, fat, and protein contents for each serving, and Weight Watchers Points Plus are included, too. Then she doesn’t hesitate to show her personality, values… making sure that whoever follows her after reading her about me page is hyper interested in what she’s saying. See what else she’s done? 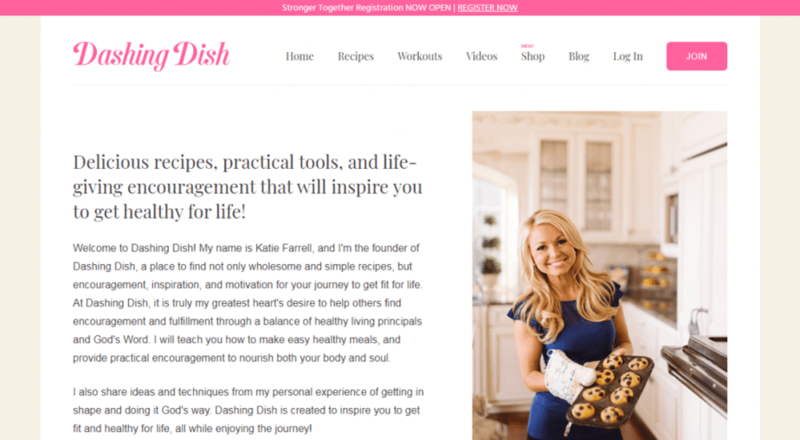 She’s cleverly included a link to those amazing recipes she talked about, I bet some affiliate links are in there too! Learn how to make your about me page make you money with affiliate marketing. When you are looking to hire someone, you don’t have the time to sift through several pages to find ‘the one’. Elna makes it easy to be won over with her about me page. Straight up delivery of irresistible value. I save you time, money and headaches. Elna strikes great balance between showing off her personality and showing off her expertise and the result is one of the best about me pages on the internet. She also makes a good point to address problems a prospective client may have experienced before with hiring on her about me page. I think everyone looking to offer services should learn how to write an about me page for a portfolio using this or Pam Neely’s example which is straight up kickass too. But are you wondering, why me? I know how to craft my writing so that it ranks in Google. Then she includes proof with photos, her formatting… By the end of the page, you know 2 things; you’ve found the right writer, she’s a human being. If you intend to make money blogging with services like Sherri did ($1.2k part time her first 6 months! ), I recommend checking out Elna’s about me page. Of all the modern about me page examples in this post, Denene’s is the one that focuses least on design. Like with Lenore’s Denene’s about me page starts with controversy, but she quickly wins her audience with her strong personality, a “what’s in it for me?”, and an “I’m the one you should listen to”. She speaks their language. 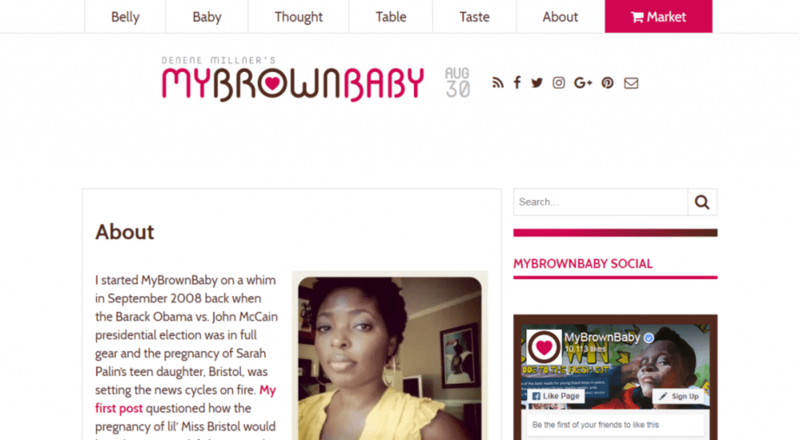 MyBrownBaby is irreverent. Funny. Full of posts that make you think. Maybe even say, Amen, because it reminds you of what’s going on behind your closed door, with your family. It’s a place where African American parents and parents of black children and their opinions matter, and are heard, respected, and revered. For their poignancy and strength. For their intelligence and authenticity. She makes it succinct but includes a link to a more detailed and more personality infused about me page where she sells her books to you! Best about me page in her niche? Yes ma’am. Kate’s about me page is targeted at moms and she isn’t shy to say so. If you are a photographer looking for about me page inspirations, this is it. This is exactly how to write an about me page for a photographer. From the very first line she speaks to one audience and she speaks in their language. Kate uses the exact words these women use, the exact emotions they feel, she’s their friend. 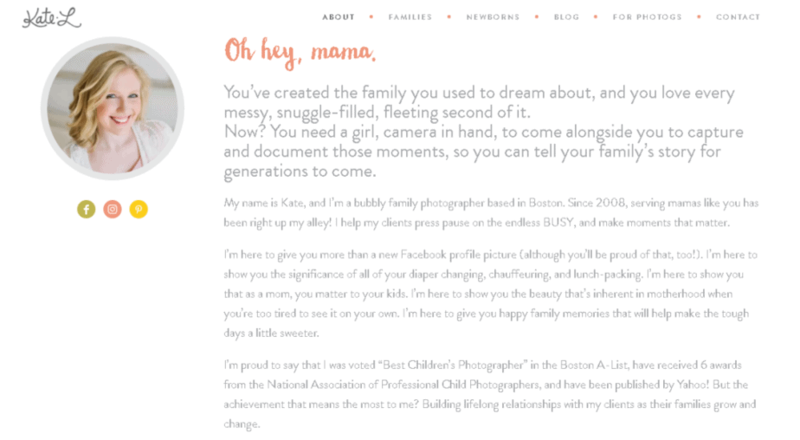 Hers’ is a beautiful example of a modern about me page every photographer and even blogger should see. Tip: People connect most when they feel like you ‘get them’, use the words they are using to show that you do. Learn how to find these words using this strategy I use to create successful optins. Quick steps you shouldn’t miss. 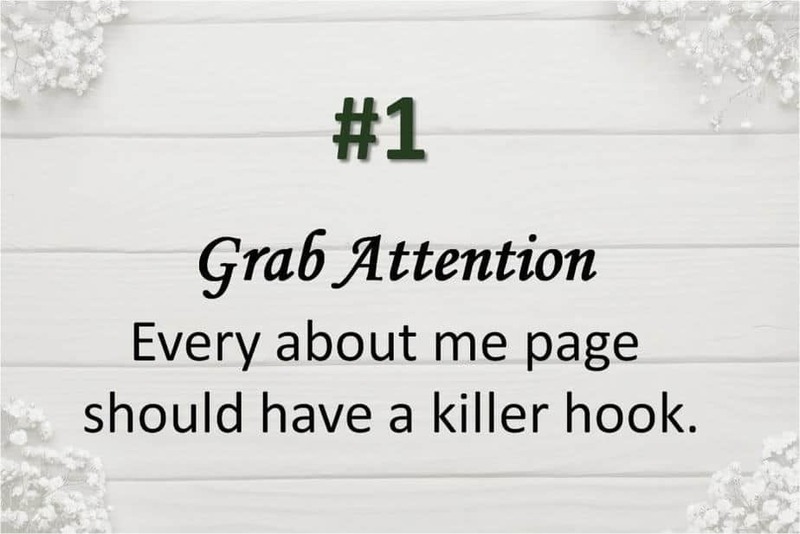 Every about me page should have a killer hook. There’s no compromising this one. You could start with a thought provoking question, or a story that makes them feel ‘me too’ but whatever you do, start by grabbing attention. Make your page reek of value that doesn’t look like self promotion. People have very short attention spans so make your about page as succinct as you can. Nothing makes people follow you more than the fear of missing out (FOMO). If you can show (not tell) people what you’ve accomplished or even better, use social proof, the battle is halfway won. How can you get social proof to include. Go through your facebook page, emails, comments, search mentions around the web using tools like mention.com and you should find some interesting testimonials to show. Like I found this in a facebook group that’s not mine! Don’t have people talking about you just yet? Pull up your stats and use that! It could be before after photos in weight loss niches, beautiful photographs for photographers, whatever it is, make it relevant. 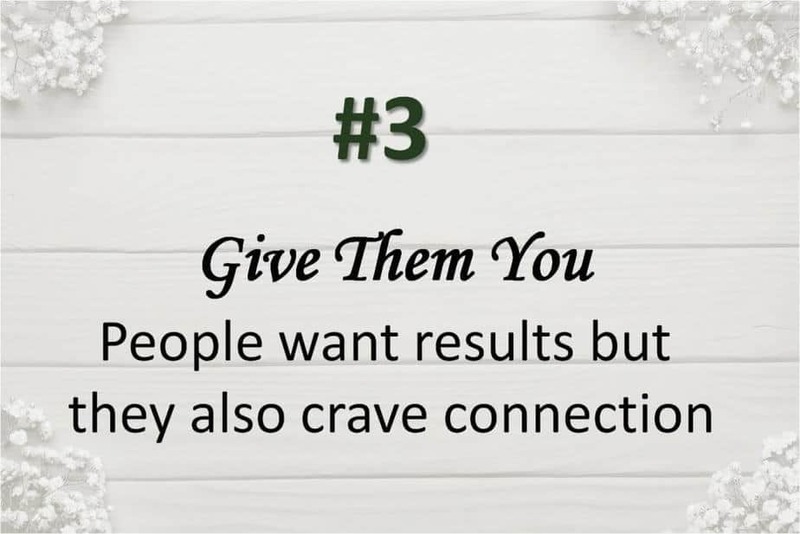 People want results but they also want connections. Jamie says in her post “The idea of #GiveThemJamie and what it means for YOUR business” people need YOUR knowledge, YOUR approach, and YOUR way of using your knowledge and wisdom to make their lives better. They want to be able to connect to you and like you as a person so tell your uniquely relevant story and do not talk down to them. Nobody likes a jerk. Example: Me saying just above right now ” do not talk down to them.” it just comes off as bossy. But adding “Nobody likes a jerk” gives more insight and dumbs down the commanding tone a bit (a bit too small in my opinion). Try to read through what you’ve written and if you would be slightly offended if someone spoke to you like that, reword it! AKA make it relevant. 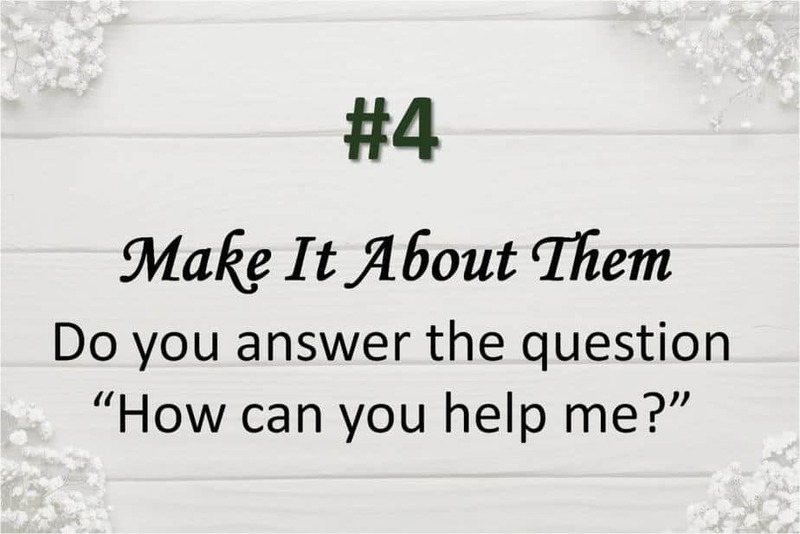 Whatever you put on your about page should be hyperfocused on answering your visitors’ question “How can you help me?”. It may be your story but they want to know what’s in it for them. In fact, I recommend using that question when drafting your about me page. If someone asked you “How can you help me?” what would you say? Record that and then type out your answer, it makes for a great first draft. Your job isn’t over yet. To make sure they don’t forget you, sink that hook and pull them to where you want them to be. It could be on your email list, you may want them to follow you on social, whatever you do don’t let them (the ideal ones) leave without meaningful interaction. See what I did? I’m giving value and incentive all at once! 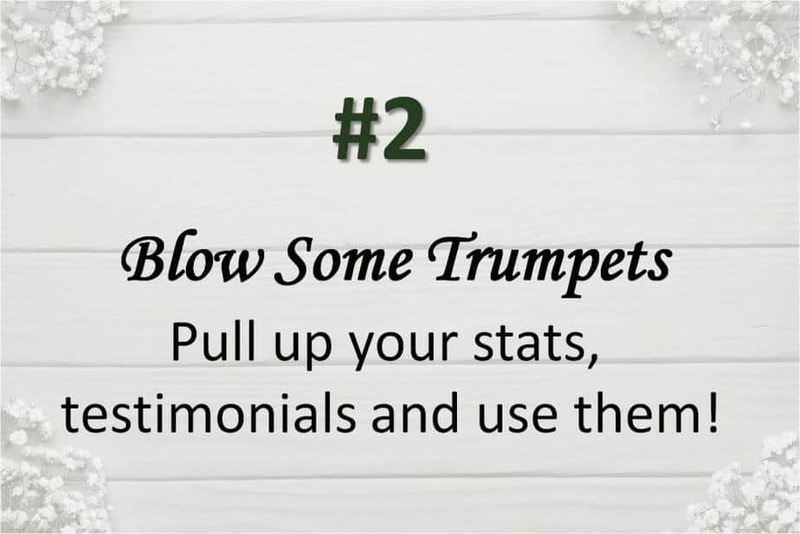 I would like to see you implement these tips and give your about page some oomph. How do I start the about me page? There really isn’t a best way to start the about me page. What works best for blogger ‘X’ won’t necessarily work best for you. That said, the first thing your about me page should do is grab attention and the surest way to do so is to talk about them right off the bat using the words they’ve used to describe their problems. Find the words they use using this method. How do I design my about me page? Most people don’t give much thought to it but the design of the about page is almost as important as the words on it. That’s why I’m pro bloggers learning some basic design skills and hierarchical presentation. A great about me page should have simple, distraction-free design that breaks things up and makes it easy for your readers to focus on your words. It’s best to get rid of the sidebar in my opinion. How long should an about me page be? Long enough to convey the message yet not too long that it’s boring ramblings. If you aren’t sure, lean on the side of shorter. It’s always better to leave people yearning for more than to make them exhausted just trying to keep up. I would say around 600 words is a good place. What should an about me page include? – Your photo(s) – lifestyle photos are best, they show the human in you. – Your voice – you really need to come through as you, a distinct personality. – Your story – only when relevant and such that it feels like their story. It makes them say if she can do it, I can too. This can also be described as your “Why?”. – Your mission – What you hope to help them achieve. – Social proof and testimonials – it’s just easier to have people and proof sell you than to try to sell yourself with your words. 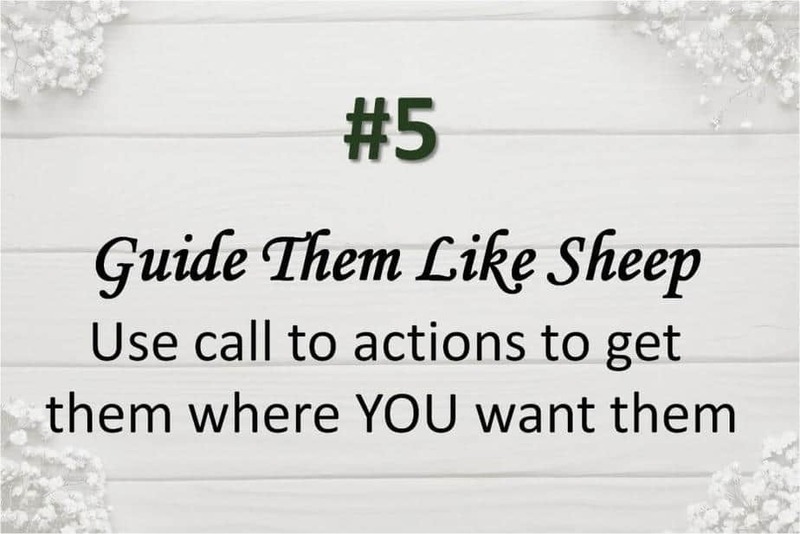 – A call to action – you’ve come this far, make sure they come back by getting them on your list or to follow you on social media. – Links – Include relevant links for more information. You could link to your most popular posts, places you’ve been featured, links that serve to position you as the expert to listen to, some affiliate links too. I link to this affiliate marketing bundle on my about page. Final Tip: The best about me pages start as a draft and remain so. Don’t dwell too much on creating the ‘perfect’ about me page, it will never be perfect. But you can have one that’s good enough and it takes improving upon what you already have. Treat your about page as a public draft and put it out there today, but first, PIN ME! Thanks Lily! this post just got me feeling better about my about page. Glad to hear that Joseph! So much goodness here and thanks for the shout out! Definitely sharing!